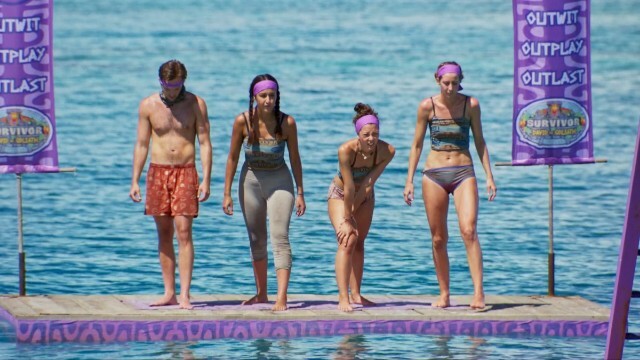 Gabby Pascuzzi and Christian Hubicki were an inseparable duo on Survivor: David vs. Goliath, which is why so many fans were angry when Pascuzzi chose to turn against Hubicki in a scheme that ultimately backfired and resulted in her unexpected elimination. SheKnows recently had the opportunity to chat one-on-one with Pascuzzi, and she had some strong words for all those haters on social media who are sending her nasty messages about targeting Hubicki, her once-close ally. She also discussed the next move she was planning to make, had Hubicki actually been voted off, and offered up a fantastic behind-the-scenes story you will only read here on SheKnows. SK: What was it that made you so close with Christian? GP: I think we were close from day one because we saw the game really similarly. We liked to strategize together. We had a lot of the same ideas, so we would soundboard off each other. We just complemented each other really well. More than that, we got along on a personal level. We’re both very emotionally empathetic people. When you see me opening up to him, he’s a very good person and listener. I had my moments, too, where I was comforting him if he was ever down. I would say we were the closest duo out there. That being said, the whole time I was allies with him, I became more and more worried about the fact that our games were so intertwined. If I got to the end with him, I had no way of really differentiating this is what I did that was different from Christian. SK: When did you start thinking about taking him out? SK: If you would have successfully voted Christian out, what was your next move? GP: I think that’s the hard thing, and that might have been my misread of the situation. I thought the game was a lot more fluid than it was. I thought I had a good relationship with a lot of people. To me, it wasn’t that I was necessarily going to go with one alliance to the very end and stick with that final three. It was more that there were a few people ahead of me that I thought were big threats in the game and multiple people would be on board with taking out. It was more of a voting bloc situation. If we take out Christian now, who is a big threat? Maybe it’s Alison. Maybe it’s Davie. Maybe it’s Nick. I didn’t know who the next target would be, but I thought there was three or four people more dangerous than me that people would be on board with getting out. SK: How have fans reacted to your decision to turn against Christian? GP: It’s been mixed. Some people — and I appreciate them — understand why I had to make a move. I was not there to play Christian’s game. I was there to play Gabby’s game, and there was no way I was winning sitting next to him. Other people are probably more mad at me than Christian himself is. They’re calling me a backstabber. They’re calling me ungrateful because he’s the reason I’m still in the game. That is ludicrous. Christian knows that it’s just a game. If you’re supposedly a Christian fan, I would say to you that Christian would not want you to act this way toward me. SK: You were clearly blindsided, but did you have a contingency plan in place to secure yourself in the event Christian played his Idol? GP: Yes! The contingency plan was that I thought Christian, Mike and Angelina were voting for Alison. There was a fake plan going around that people were voting for Alison. Even I told them I was voting for Alison. So I thought that if he played his Idol that Alison was gonna go home. SK: So when he played his Idol, did you still believe Alison was going home? SK: Are there any behind-the-scenes stories you want viewers to know?